Ujungkulon National Park is one of the last remaining natural forest on Java and one of very few areas offering a profile of sea-shore to mountain top tropical vegetation. The park holds well over 700 species of plant life of which at least 57 are classified as rare in Java, and perhaps the world. Although a great deal of Ujungkulon’s forest is as it was centuries ago, some areas have been modified by the force of nature. Tidal waves from the Krakatau eruption have inundated the northern shores and volcanic ash deposits at times have impeded plant growth. People have also played a role in altering some of the park’s vegetation. Areas of Ujungkulon were once cultivated by the local people – the grazing grounds of the Cigenter and Cidaon were past village and paddy field sites – and until the 1930’s the land was being burnt to increase grassland for game hunting. Among the most fascinating of the park’s plant life are the many species of figs. These can take the form of trees, climbers of epiphytes and are the larders of forest that provide abundant fruit for the wildlife. The strangling fig begins from seeds deposited in cavities in the trunks or branches of large trees by birds, bats and other small animals. Once germinated, the fig sends veils of tendrils down into the soil which then form a lattice work of roots around the trunk of the host tree. Eventually, over-whelmed by the vigorous fig, the host tree dies and rots away, leaving within the roots of the fig the hollow shape of original tree, its strangled victim. A number of trees such as the Kigentel, the Tokbray and the Kondang produce flowers and fruit on their lower trunks or larger branches rather than at the usual twig ends. Why this interesting characteristic, called cauliflory, has evolved is puzzling. One theory is that the fruit of these plants, being more accessible to larger animals, allows the seed to be scattered over a wider area. However, other animal such as monkeys and birds become more vulnerable because they must leave the safety of forest canopy to feed upon the cauliflorous fruit. The climbing lianas are feature of rain forests and grow towards the light without damaging the host tree. These vines only fruit and flower in the forest canopy and to regenerate must reach the sunlight. They create aerial pathway for wildlife, assisting in their search for food and in seed dispersal. 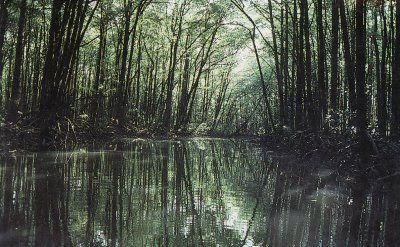 Several species which include kawao, leuksa and asahan are water-logged with sap. Not only animals benefit from climbing plants. Certain climbers are high medicinal value and are used in the treatment of cancer and in Indonesian traditional tonics jamu. Others provide the Derris root powder used in insecticides or the latex in chewing gums while yet another produces a substance that is 1.500 times sweeter than sugar. Another climber is the aggressive rattan, valued in furniture making, which use the thorns on its whip-like tendrils to attach itself to vegetation and passers-by. The angle of thorns enables the rattan to anchor deeper with any attempt to pull away from it. As with other palm, its tightly folded immature leaves are very palatable to wildlife. One of the characteristics of Ujungkulonforest is the wide variety of palms of which the most common is the langkap. Although these forests are found in very few other locations in the whole of the Malayan region, its rapid regeneration and ability to spread into undisturbed forest has made this a dominant species inUjungkulon. Rain forests also hold a wide variety of epiphytes and although they also grown on trees, inflict no harm. They include the splendid bird’s-nest ferns and an abundance of orchids. The brilliant white with a yellow centre Moon orchid, the deep red Pipit orchid, the white to purple Squirrel tail which only opens for one day, are just a few of the varieties. The most obvious characteristic of these areas are large trees with high canopies and more open undergrowth which usually make walking in this type of forest not difficult. The largest are of primary forest in the park stretches from the highest point of Gunung Honje Range to the south coast. On the Ujungkulon peninsula, roughly a third is primary forest. It covers most of the Gunung Payung Range with narrow band crossing eastward to a large oval-shaped tract in the central Talanca Plateau. Peucang Island also has a fine, although unusually spacious example while on Panaitan Island it is isolated to the slopes of Gunung Raksa. The tallest of the trees in Ujungkulon’s forest include the fan palm gebang, the bengang and the salam which can grow beyond the high canopy species to heights of 40 meters. Just beneath them the large trees such as bayur, gadog and in the Gunung Honje region the putat, all of which may grow to 35 meters with under-stories at 20 to 30 meters beneath the closed canopy. Of these trees, the salam, bayur and putat are the ones which have the largest plank buttresses flowing from their trunks to the soil. The young secondary forest lies between the primary forest and the coast, occupying most of the Ujungkulon Peninsula, Panaitan Island and the lower slopes of the Gunung Honje Range. 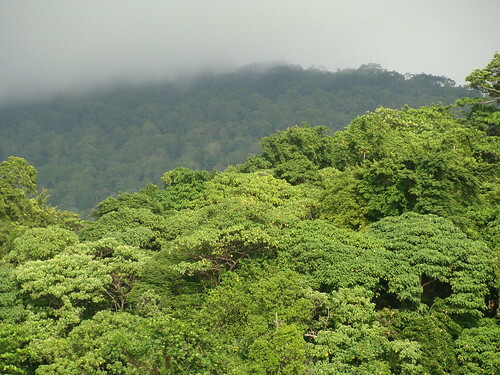 The density of vegetation can make this type of forest impenetrable and jungle-like in places. A common trees of the secondary forest is the bungur. This tree produces a spectacular purple display and its prolific flowering around October to November is believed by the local people to indicate the beginning of the rainy season. Most of the bamboo species found in Indonesia are not truly native but this does not apply to the two pre-dominant species in Ujungkulon. The bamboo cangkeuteuk favours steep slopes and river banks while the bamboo haur likes the wet soil of the uplands. The impressive giant bamboo, used in furniture making, is not common in the park and tends to be associated with former cultivation sites. The most outstanding trees of the coast include the pagoda-shaped katapang and the robust nyamplung which has bunches of bright green fruit resembling large marbles. The sands are often scattered with the magnificent white-petal flower of the broad, low-branched butun tree. These flowers are as large as an opened hand and hold numerous pink tipped stamens which exude a strong, rich perfume. They drop to the ground in the early morning where they are raided by pollen collecting wasp before rapidly wilting. Hibiscus-like flower of waru laut change in color from bright lemon to deep brownish pink and are also widely found on the sea shore. Of the coastal vegetation the most distinctive is the giant pandanus. Its notable features are large reddish pineapple-shaped fruit and a network of tripod-like supporting roots emerging from the trunk some meters above the ground. Large stands of pandanus are found along the south coast of Ujungkulon. The coconut palms, although not numerous, are believed to have been mostly planted by people rather than washed up by the sea and often indicate the sites of earlier cultivation in the park. Beneath the canopy species of the shore are stretches of tarum, a shrubby lupin-like tree with yellow flowers and long thin pods behind which shelters the white spidery-flowered bakung lily, used by local people as fishing lures. While twining across the sands from the verges of the forest are the bright pink flowering convolvulus. The mangrove forests of Ujungkulon are mainly situated along the shore of Welcome Bay and their root system can vary in appearance. Some are stilt-like, as found in the surprisingly attractive mangrove lined rivers of the Cihandeuleum and Cikabembem. Another species has root poking above the mud allowing them to breathe at low tide and these can be seen south of Tamanjaya. Yet, another has tendril-like roots hanging from lower branches. The mangrove’s fruit and seed system also have special adaptations such as seeding that germinate while still attached to the parent tree allowing them to quickly take root once they drop. Their seeds come in while a wide variety of shapes and size and being buoyant can drift in water for weeks. Mangrove forests support a wide range of other life form including marine life and are one of the most productive of all the natural environments that the bounteous rain forests contribute to our planet.